Gym studios always have a mirror on their walls today. Do you ever ask yourself why mirrors are a must for modern gym designs? Well if you have not yet, you need to find out why they are popular in gym designs. Many types of gyms are in existence today. Some gyms are used for a sporting while; others are used for fitness and dancing. The use of mirrors is essential to help users in monitoring their body movements and ensuring they are doing the right things. They are also helpful to the instructors to monitor the people they are training within the gym. Gyms are filled with different types of equipment which are placed I strategic locations. The mirrors to be installed within a gym are dependent on some factors including the amount of space available. When the space is too limited, the size of the mirrors that can be set within the gym may be small. Gym mirrors are usually placed on walls of the gym room so that they can be conveniently used by dancers or athletes who want to improve their body fitness. Usually, when the athletes are practicing, they stand in front of the mirrors and observe the body movements. When lifting weights, they need to check the change in their muscle structure. It is assumed that the athletes may not estimate their progress and the effort required to change their muscle structure if they do not observe what they are doing. This is where the gym mirrors come in handy. Also, in many instances, the instructors within the gym are required to demonstrate various techniques to the trainees. This means that they have to stay in the same position just like the trainees. This enables them just to observe and do exactly what the trainer is doing. With the gym mirrors, the trainers can comfortably get instructions to the trainees and also monitor their activities by observing the reflections. What Factor Should I Consider When Buying Gym Mirrors? Buying gym mirrors for the first time will be challenging. If you are thinking of opening up a public gym or having your home gym, it is essential to know the factors that are crucial when buying them. The following are things that gym and homeowners should always consider to ensure they have the best gym mirrors. The available space determines the size of the mirrors within the gym. The headspace which is from the floor to the ceiling should be enough to warrant the installation of large mirrors. When space is limited, considering the room’s height, smaller mirrors may be suitable. The gym owner should have the exact dimensions of their gym including the height so that they can purchase the right sizes for space. Also, they should seek the recommendation of gym professionals and interior designers to identify the most suitable sizes to be installed in a modern gym. Some gyms in modern time are specialized in offering specific services. Unlike traditional gyms which were equipped with all types of equipment, there are those that have only a specific line of equipment to satisfy the needs of particular customers. With this, the gym owner ought to known the type of gym equipment within the gym so that they can decide on the most appropriate mirror designs to set. For instance, having horizontal or vertical mirrors. The vertical mirrors are placed in a normal way which is conventional even in homes. Mirrors are placed with the longer side being vertical. When the equipment within the gym are higher than half a meter, it is advisable that such mirrors be placed half a meter from the floor. This minimizes the chances of damage when moving the equipment around the gym. Ideally, to minimize wastage of the mirrors or the need to install many vertical mirrors next to each other, the horizontal design can be adopted. The horizontal design entails having the mirrors longer side placed horizontally and the shorter length being vertical. With this design, the gym owner can avoid damaging the gym mirror whenever the equipment are being moved around. Also, they can refrain from using many gym mirrors to fit a particular place within the gym. Typically there are two primary types of mirrors that can be installed within a gym. They include the portable and fixed gym mirrors. With the portable gym mirrors, they are suitable when the gym is on a rental basis. Gym owners may decide to rent a particular space for a short period to serve a particular audience. With this, they would be required to have their equipment always with them. This includes the gym mirrors which do not have to be fixed. They are mounted on rollers, and they can be moved to any position within the gym. They are popular with gym enthusiasts who also travel a lot. They can carry them around and use them whenever they need to. The fixed gym mirrors are those who are permanently fixed on the gym walls. Ideally, adhesives are used to stick the mirrors to the walls. The permanently fixed mirrors are mostly set in home gyms or public gyms which are owned by the building owner. Alternatively, to avoid destruction to the will, the gym mirrors may be hung on the walls. Having trendy mirrors within a gym makes it trendy and flashy. 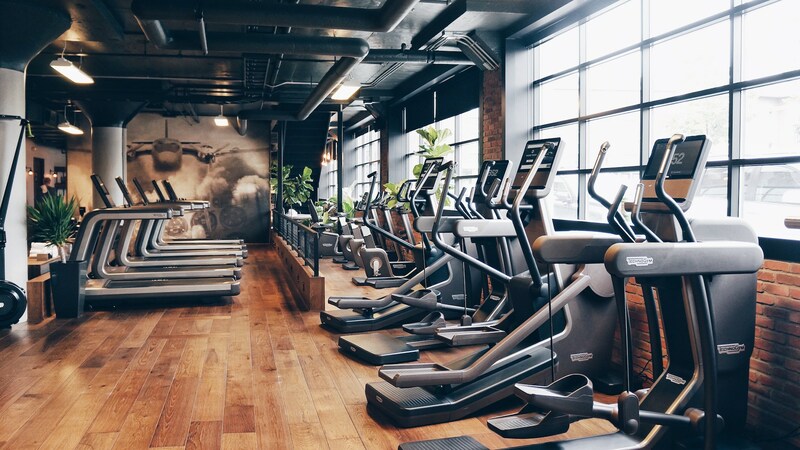 Home or gym owners can incorporate the modern designs in their gym so that they can attract users or minimize on costs of renting permanent places. Folding mirrors together is a current trend in the construction industry. Designers have come up with a design that allows two or more mirrors to be folded together and be moved to different locations. When fixing foldable mirrors, technical know-how is required so that there is minimized damage. Usually, when fixing the hinges, the technicians are required to be careful so that they can ensure the mirrors have free movement when being moved around. If you decided to use these types of gym mirrors, it would be recommended that the services of an experienced mirror designer are sought. Multi foldable mirrors are customized for gym owners who would like to have big sizes of mirrors for their gyms. More than two mirrors are held together using the special hinges which allow them to be placed on top of each other comfortable without breaking. Gym mirrors require regular maintenance so that they can serve the home or gym owner perfectly. Gym mirrors should be regularly cleaned using a soft material to avoid scratching. Having scratches on the mirror can distort reflection images which are more desirable for long-term gym owners. Also, cleaning agents that are suitable to remove stains should be used in the cleaning process. Cleaners should, however, be cautioned against using wire brush since they are hard and may cause scratches in the long run. It is essential that every gym owner identifies the suitable cleaning agent to maintain the mirrors. Gym mirrors are usually hung on the walls. Therefore, the equipment should not be placed too close to the mirrors. They may cause damage by scratching or breaking the mirrors in the long run. The gym owner should draw a line of where all the equipment should not cross. This would help the cleaners among other gym users to identify where they should not put the equipment. This way, the mirrors can last a lifetime without breaking, cracking or getting scratches. Buying gym mirrors requires either experience or being knowledgeable. When buying mirrors from vendors, it is essential to check on a few important factors that will help in identifying the best among the existing ones. The following will help you in selecting the best gym mirrors for your personal or public gym. We all have bad experiences with mirrors that have poor reflection qualities. Gym mirrors are required to have high-quality reflections for convenience and accuracy. When they are not of good quality, poor reflections are created which may affect the moods of the athletes, dancers or other individuals involved in the process. When buying the gym mirrors, check on the quality specifications and go for the most quality of the available mirrors. Gyms are frequently used for rigorous activities. Accidents may happen which could lead to glass breaking. Therefore, using the hardened glass for the gym mirrors can help to improve the level of security in case of accidents. If the hardened glass is used, there is no risk of the gym users sustaining cuts from the shattered glass. Next Post How Yoga Practice Can Make You Fit And Healthy?